The United States bourgeois press didn’t learn the cliche that “a lie told enough becomes the truth,” it practically invented that method. From ThinkProgress to the New Yorker to the Atlantic, it doesn’t take Republican-alignment to find producers and publishers hurling falsities down an echo chamber. Back track to the 1960s. To spoil one of my favorite long-form stories, I have had interviews with a Pananian former CIA agent. His work was not only to inform the agency of local political or military insider information, but to misinform. The CIA sent him scripts to read on his radio show to the Panamanian public for decades, and he was brought to the United States to tour and spread more misinformation about Panama-US relations in universities in the United States. I still have copies of the letters and photographs that prove his point. The CIA, was not alone, and he recalls recruiters from many US agencies and private contractors in the 1960s going after local students and officials. In order for the United States to be sure there is democracy, clearly, it has to make sure it controls the democracy. The problem with misinformation is that it acts as a decoy. Rather than responding to the confusion or curiosity of sectors of the general public- maybe writing to youth or academics or working class families- too many of my comrades on the Left direct their focus to responding to the spray of vitriol. It’s like being afraid to put your washed clothes out to dry and instead washing what you’re currently wearing because the upstairs neighbor keeps dumping their bath water. The sheer volume leaves the respondent in shock and unable to even find sources to say otherwise in the search engines. A little decoding doesn’t hurt, but it all detracts from remembering our main mission to uncover the truth in the pursuit of social transformation. If you do it, do it short, sweet, and with a sense of humor. It doesn’t take a decoder ring to parse through the language of the bourgeous press. Outspoken — Hugo Chávez was an uppity brown man who talked back to the United States. Divisive — Hugo Chávez supported the poor and the working class, rather than US interests and local elites. Extroverted — Hugo Chávez tried to inspire other countries to be uppity brown people who talk back. Bought his people off with oil funds — Chávez used his country’s resources for social progress rather than having been bought off himself by the oil oligarchy. 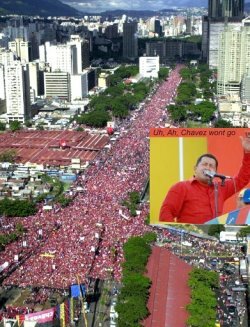 He ruined the economy — Chávez made it harder to plunder Venezuela’s resources, prioritized social progress over the ephemeral cult of growth, and funded social programs rather than surrendering to austerity, and we will forget to mention the US-sponsored destabilization efforts that included a 2002 coup and oil industry lock-outs. Drunk on oil profits — The profits of oil stayed in the country and didn’t just make rich people richer. As opposed to the renaissance in the Persian Gulf. Chávez consolidated power — away from the local oligarchy and foreign capital. The Chicago Tribune and many newspapers supported the authoritarian coup attempt in 2002, in the Tribune’s case in an unrecalled editorial in the same front section that showed Chávez’s return on the front page. Oops. Chávez was an anti-Semite — Chávez didn’t support Israel. There is no security — Chávez didn’t use the highly authoritarian styles of policing that also haven’t worked in Mexico or Central America. Anti-US/tense relations with the United States — He showed the United States Venezuela was not their backyard. Strongman — See Chávez consolidated power and add orientalist-style denigration of brown peoples’ capacities to make their own democracy and their own destiny. Authoritarian — Don’t read the article about the US federal governmen’s assertion of its right to kill US citizens on its own soil, or the US support for Fujimori, Pinochet, Rios Montt, Somoza, Trujillo, Noriega, Suharto, Marcos, Stroessner, Mobutu, the Shah, the Greek Colonels, Saddam Hussein, etc.